On-board access to realtime aeronautical information is now possible for pilots operating at Vaclav Havel Airport Prague via a new web application called CrewPortal. It has been created and is operated by Air Navigation Services of the C.R., Aeronautical Information Service. Flight crews can use it to view relevant AIP SUP, NOTAM, ATIS, meteorological and other information that will come in handy for pre-flight preparation and also just before departure. The new application also follows the incipient trend of replacing voluminous paper information by mobile electronic devices on the flight deck. It supports all modern web browsers, including smartphone and tablet browsers. 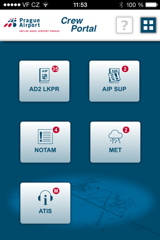 In addition, it is possible to add CrewPortal to the homescreen on the iOS platform and use it as a standard mobile app. Prague airport also provides wi-fi coverage of all apron stands (via cah-guest and prg.aero-free wi-fi networks) so that flight crews can access aeronautical information right from the cockpit. CrewPortal underwent testing in the summer during the RWY 06/24 closure. In such situations it can help pilots raise their situational awareness and positively affect safety of the flight. 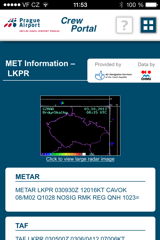 Operational trials were finished by the end of september and CrewPortal is now available to all Prague/Ruzyne aerodrome users on http://lis.rlp.cz/lkpr.